Go Vroom, Vroom with Natural Pod - Mamanista! Natural Pod is one of my favorite boutiques for children’s toys. All of the products are so lovely and I feel good knowing they are made from eco-friendly and child-safe materials, by fair-wage workers or independent craftsmen. 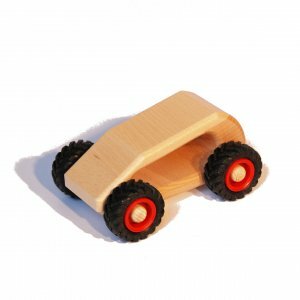 My preschooler checked out the Wooden Van (CAD $25; about US $19.50), a charmingly simple wooden toy automobile. Sturdy, solid and easy to grasp, this van is a great choice for even younger babies. The big rubber wheels keep the van on a steady path as your child zooms it across the room. Toy cars are great fun because we can talk about speed (go fast, go slow) and direction and children can play alone, with a parent, or other children. We like to “drive” our car around on a special play mat with roads or through a town built with blocks. We also featured the Poot & Boogie Dolls, available at Natural Pod in our Hottest Holiday Toys 2008 Guide. With built to last gifts that will enrich and delight, Natural Pod has a unique selection of heirloom-quality, natural and organic toys, clothing, and gifts.